ill you allow me to commit rock-crit suicide and admit that sometimes I want to write like Lester Bangs? Not that I want my words to sound like his, just that I'd love to be able to forgo the "musts" of professional journalism: finding a subject, learning about that subject, writing coherently. How much nicer would it be to just blather about how drunk I am, what I'm doing at the moment, and include a few plangent anecdotes about my life that relate vaguely to the Pink Floyd album I've been listening to incessantly? Jingle this: instantly transporting oneself to a happy place. "But, but ..." my readers sputter. "When have you ever, even remotely, resembled a rock critic?" they opine. Though it's not the point, point taken. So I'm freshly back from the Aalto Lounge (where my art hangs currently  plug, plug) with a glass of wine under my belt and no dinner. 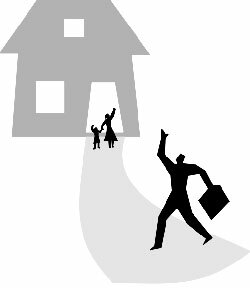 And, since I haven't done a damn thing to satisfy my "professional mandates" as a music reviewer, I'm left wondering: How do I spin my fascination with the current American Equity Mortgage jingle into a legitimate column? One way is to waste a paragraph break on a single two-word sentence. Another is to speak with great passion about that jingle, a jingle that quite cleverly employs musical techniques to make you feel that if you just buy a new house or refinance your current one, you'll be instantly transported to a happy place where your grandmother is serving you cookies and milk in front of a crackling fire. 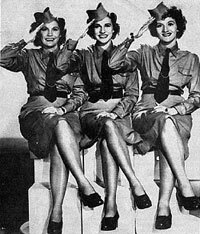 Lucky stars: the Andrews Sisters. Singing women entice you to seize your future in a new home with a lilt that would make the Andrews Sisters thank their lucky stars for knob and tube wiring. Yes, it's brilliant Baby Boomer/Generation-X recidivist programming playing on faded, misleading memories born of the fantasy that their own parents carried on from their parents' depression-era lives. A corny, third generation marketing illusion. And, seriously, I hope they didn't put that much thought into it. That would mean your advertising agencies are filled with lushes bigger than I. But whatever the case, the ad is working for me. I think I'll go refinance right now! Might need to lower those mortgage payments, too, if I keep wasting my time watching the other American dream: "American Idol." While shirking my duties as a "rock critic" I find it fun to be a few decades behind the times and deconstruct "Idol." Judge not: fun to hate on Simon. It's interesting how, through airtight scripting, reality television has risen to the level of genetic engineering. From herd-instinct mocking of (regrettably) idiotic people, to thrilling to the ready-made "success" stories it portrays, "Idol" plays the viewers' strings like an expert harpist. And, like expert TV, it's really entertaining, even if just to hate on Simon, who is more needlessly cruel than ever this season. But, after the first few episodes of gaping at the delusional qualities of the poor aspirants  who are obviously mostly insane and let through just to generate a few good moments of leering pathos, things get as boring as the ultimately uninspiring cookie-cutter singers that rise to the top. I guess that's what you get when you conjure up an exaggerated, accelerated version of a seemingly "natural" process that takes years in the real world. One thing for sure is that there's no reality present in this reality music series, wherein tens of thousands of singers are lead to believe (Oh, if only for an instant!) that they can circumvent the realities of life. Reaching the broadest audience: reassuring and bland. That's why many of the daydreamers who make it on camera for their first and last time presume that almost being able to almost carry a tune is a righteous claim to the "Idol" throne. As if we needed any other reasons to realize what a carefully crafted freak-show "Idol" is, ask yourself this: If the show is really about finding the next all-purpose, lowest common denominator pop-star, why let people through who clearly can't win, such as the square-headed cowboy who sings to his turkey? See, now I'm hooked on the cheap laughs, too. That's how insidiously these sensationalistic "human interest" tales rook you into embracing the "Idol" vibe. Popular culture like "Idol" and radio advertising reach the broadest audience by being reassuring and bland; here in America we like to take that culture in homes we feel are our birthright to own, knowing full well that all we need is one break to become the next ubiquitous superstar millionaire.